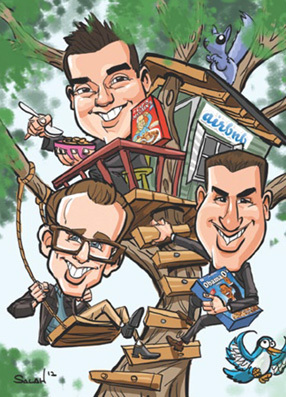 The backs have a caricature of the owners and the faces show 54 of the different participating Air B&B locations. From major phone companies to manufacturing firms throughout the world, promotional playing cards are an increasingly popular way to market a companies brand and broadcast the company message, products or services. Personalized card decks are unique, and in the case of Air BnB - the message is location, location, location - 54 times! Certainly promotional playing cards have a longer "shelf" life in the client's pocket or on a client's desk - or even in their home - than a standard business card, brochure or most other imprinted promotional giveaways. The key is to be clever, consistent and interesting, coincidentally that is also what makes anything a great promotional piece - so why not think a little deeper when creating a deck of playing cards. Promotional playing cards can be used to introduce new products, familiarize a client base with available inventory, promote catalog items, concepts and even to generate new leads for sales. Standard custom backed card decks can also include a unique EXTRA card which can be used as a coupon, a business card a chart unique to the industry being promoted or a pocket sized yearly calendar. Used as an incentive item - the coupons can be redeemed without affecting the integrity of the other 54 cards in the deck. This is especially useful for community decks - or advertising decks - where each card contains an advertisement for a business. Backs have the Rincon logo and the faces show 54 of the differentparticipating Rincon Retail locations, each face features an ad or a special offer. 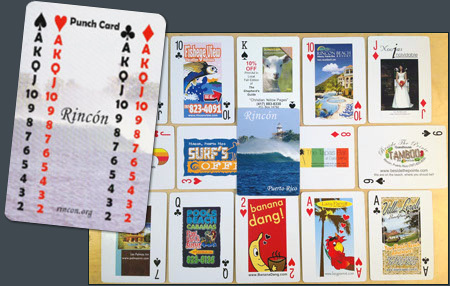 The Rincon deck contains ads on each face of the regular cards in the custom card deck. The extra card is called the PUNCH CARD has all the card icons on it which represent each of the regular 52 cards in the deck. The punch card can be carried in an end user's pocket when visiting retailers to redeem the promotion on the faces of the cards. 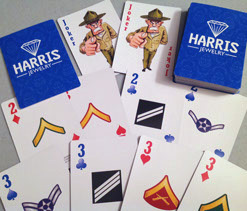 Personalized printed playing cards are a great way to make a statement. Your personalized playing cards will be kept by your recipient for years to come. The imprint and meaning will be maintained in its form on high quality, plastic coated, personalized playing card stock. A gift of personalized playing cards has become the new way of expressing your feelings toward a loved one or a friend. Because creating personalized playing cards is virtually unlimited, we take pride in being the one playing card company that delivers on time and meets our promises. This is especially important when your Personalized playing cards are a gift which need to be given on time. Party favors in the form of Personalized and personalized playing cards have become popular for bar mitzvahs, engagement parties, birthdays, weddings and anniversary events. As a Wedding favor, birthday favor, Sweet 16, Anniversary Party favor, Birthday party Favor, Bar Mitzvah Favor or Bas Mitzvah Favors - personalized playing cards are a keepsake that will last forever. At Ad Magic we create great Personalized designed playing cards for party favors of all types. Many samples are shown on the site but feel free to ask for samples of your own! AdMagic can create a Personalized deck of playing cards for special affairs, conferences, trade show giveaways, premiums, special events and promotions, product catalogs or just as a business gift from one company to its clients. Such branded logo playing cards have become a celebrated business gift idea.. The recent popularity of Personalized playing cards as gifts and promotional items has grown rapidly since poker has come to be such a hot game.